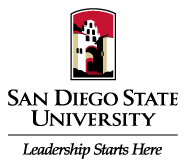 Students have several scholarship resources to help finance their education and educational experiences at San Diego State University. The list below provides information and links for scholarships offered through the School of Communication, College of Professional Studies and Fine Arts, and San Diego State University. We encourage students to submit a FAFSA early in the academic year and attend to various scholarship deadlines. Scholarships are also an excellent way to donate to the School of Communication.